Are you craving for something to eat? Is your mind thinking of grilled cheese sandwiches oozing with piping hot cheese? Or is it reminiscing the perfect hamburger; succulent and juicy, but then you realize you do not have the correct appliance to cook and get the right taste and flavor? Are you stuck in the old debate between using a grill or a griddle? We have decided to solve your problem and explain to you the difference between the two and then you can decide for yourself which one suits you better. A grill is a cooking appliance that is essentially a metal plate having ridges or a mesh of vertical metal (iron) bars on it. Heat is supplied from the bottom of the plate using either coal, gas or electricity. The plate heats up and in turn heats the metal bars due to conduction. Raw food is placed on the metal bars. The hot metal bars cook the food. We usually grill barbeque and cook hamburgers on a grill. There are numerous types of grills available in the market. 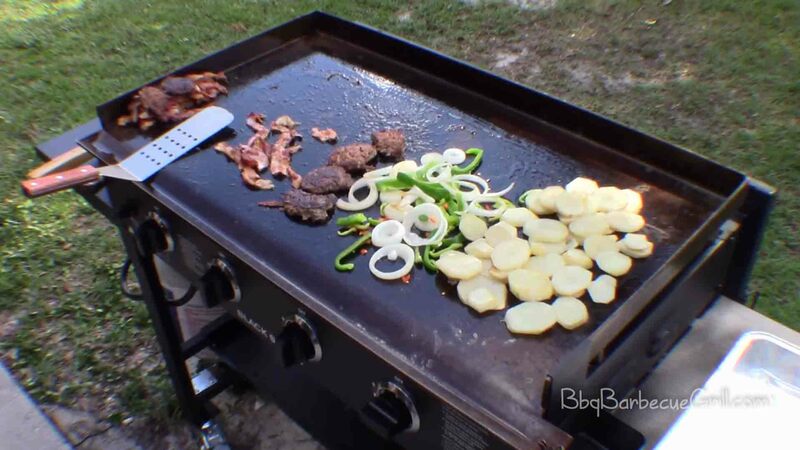 A type of grill that we will be discussing in this article is the flattop grill. How is a flattop grill different from a traditional grill? A flattop grill is slightly different from people generally perceive a grill to be. This grill is essentially a slightly convex metal plate with no bars on it. The plate is heated using a circular heating coil. In the ancient times, a flattop grill was usually made out of clay but during recent times it is available in different metal tops. They also use either gas or electricity as their source of power. We have heard plenty of people boasting that they cook their hamburgers on griddles and that they taste better. So what are these famous griddles and do they really make your food taste better? Griddles are flat metal plates that use gas, electricity, wood or coal to heat up. This appliance can be used to for multiple cooking techniques like shallow frying, sautéing, heating etc. Griddles can be used for residential as well as industrial purposes. Residential griddles are small and portable. Industrial griddles are stand-alone appliances. The plate is extremely important as the material it is made from determines the time it takes to heat up, and the maximum temperature it can heat up to. The biggest advantage of using a flattop grill is that the circular heating coil helps in a very even distribution of heat throughout the plate. This provides consistent heat and results in delicious, properly cooked meat. 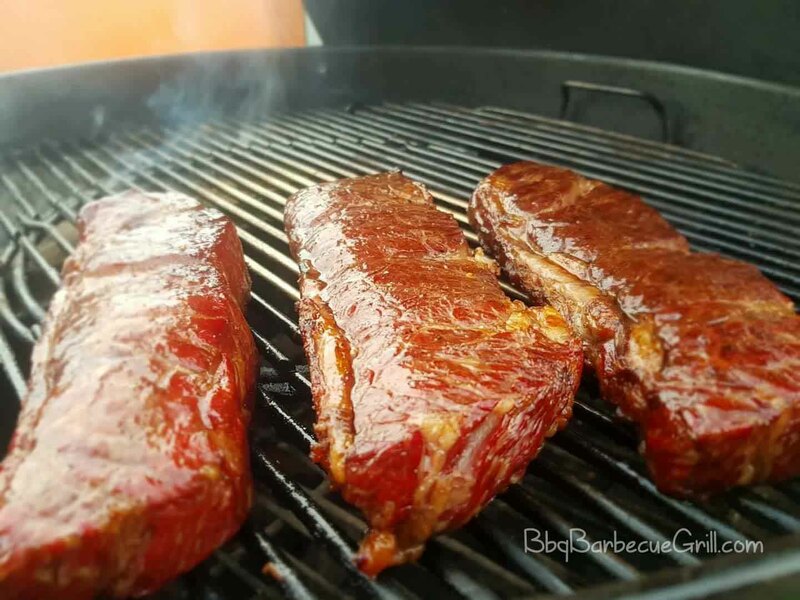 It does not take away from the flavor of meat, instead, it can enhance it by providing them with a smoky flavor. The even distribution of heat does not require you to keep on moving or flipping of the raw food on the surface. Moreover, a flattop is very versatile as it can be used as an alternative for stove tops as you can cook food directly on it and also cook in pots on pans by putting them on it. They also avoid the problem of food falling into the bars of the traditional grill. The griddle is perfect for creating different zones of temperature to cook multiple things that require different amounts of heat at one time. It becomes very beneficial for commercial uses as one can easily multitask. This is possible due to the vertical heating element placed under plate which allows to create extremely hot, hot and warm zones on the same plate. Cleaning the griddle is also easy as it is just a flat plate that does not rust and just needs to be scraped and wiped off with a rag. (It is usually beneficial to brush it with a thin, even layer of oil after cleaning it to keep the non-stick quality intact and reduce wear and tear). As with all electrical or cooking appliances, one must be extremely careful while using grills or griddles. When stand-alone griddles start heating up, their handles and edges heat up as well. So please make sure you are wearing oven mitts or heat resistant gloves while cooking. Furthermore, one should always be careful of excessive oil or grease as grease fires are very common. Please keep your face and hands away from the cooking appliance to avoid burning. Also make sure that the systems are placed in appropriate conditions, away from combustible materials and fixed properly to avoid any hazards. Both of these appliances are quite similar in appearance but as we have mentioned they both function differently. Flattop grills are great for cooking seafood, meat and in general cuisines that require a very high, even temperature. Griddles, on the other hand, are better suited for cooking multiple things at a time as it provides us with an opportunity to divide the same heated surface into different temperature zones. Furthermore, flattop grills can be easily fitted on top of your stoves at home. This is because you can use pot and utensils to cook food on them, in addition, to directly cooking on the surface. A griddle is usually stand-alone and needs more space and a larger exhaust system as it produces a lot of smoke. It is perfect for commercial chefs. 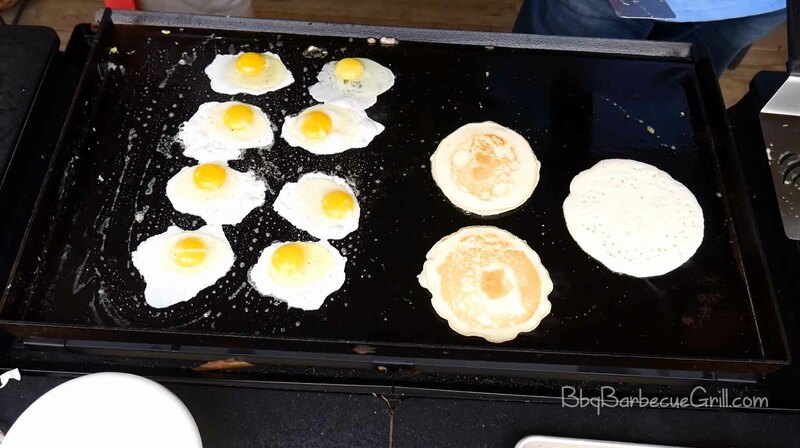 Nowadays, some griddles come in a portable size so that you can put them inside your home. You can also carry them to barbeques and parties. We have analyzed and explained the salient features of both the appliances. Choose one carefully, keeping in mind your requirements, space restrictions and the type of use you have. We hope that we have answered and addressed all your questions about grills and griddles. Go and buy one of these appliances and start cooking delicious meals to satisfy all your cravings. Don’t forget to share this article with your friends so they can benefit from this information as well. Maybe they will invite you to the next dinner they cook using one of these appliances sometime!